DA Form 7451 - also known as the "Me Caliber .50 Heavy Barrel Machine Gun Firing Tables Iv (a) And Iv (b), Night Qualification Scorecards (mounted Or Dismounted, Prone Or Fighting Position)" - is a United States Military form issued by the Department of the Army. The form - often mistakenly referred to as the DD form 7451 - was last revised on April 1, 2017. Download an up-to-date fillable PDF version of the DA 7451 down below or look it up on the Army Publishing Directorate website. 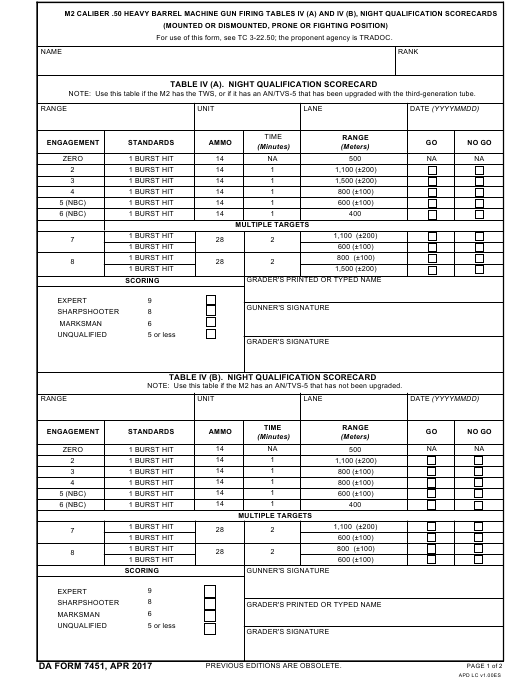 For use of this form, see TC 3-22.50; the proponent agency is TRADOC. NOTE: Use this table if the M2 has the TWS, or if it has an AN/TVS-5 that has been upgraded with the third-generation tube. NOTE: Use this table if the M2 has an AN/TVS-5 that has not been upgraded.